With less than a month of games left, the dog days of the NBA regular season are officially upon us. Playoff-bound teams are looking forward to the excitement of the postseason, while those at the bottom of the standings are getting a better look at their young players and hoping luck is with them when the May 14 draft lottery arrives. Every team still has something to play for, however, and a reason for you to pay attention, even as the games become more and more meaningless. And then there's that handful of teams chasing playoff spots and seeds, for which games get even more crucial as the season progresses -- just ask the Denver Nuggets, who missed out on the playoffs because of a loss to the Timberwolves in the last game of the 2017-18 regular season. Here's a look at the most interesting storyline to watch for every team heading into the final month of the NBA regular season. Will they get Dallas' first-round pick? Swapping Luka Doncic for Trae Young on draft night was looking pretty bad early in the season when Doncic was lighting the NBA on fire. But Young has developed into the potential future All-Star the Hawks thought he would be, and the sweetener in the deal is the Mavericks' 2019 first-round pick ... as long as Atlanta gets it. At first it looked like the Mavs might make the playoffs, which would have devalued the pick considerably, but now the Hawks have the opposite problem -- if Dallas' pick falls in the top five, the Mavs keep it and it rolls over to next season with the same protection. Given Doncic's progression and a potentially healthy Kristaps Porzingis, you'd have to think their pick next year would be late-lottery at best. So for the Hawks, they're hoping the Mavs' pick lands right at No. 6 and theirs falls above that, giving them two top-six picks to help continue to build their emerging roster. What is their crunch-time five? We've come all this way, and the biggest question surrounding the Celtics is the same one we had before the season started: Which five players will be on the court in the closing minutes of playoff games? Gordon Hayward has been up and down all season, as has Jaylen Brown, but do you really trust Marcus Morris on both ends of the court in a tight playoff game? It could be matchup-based come postseason, but at this point it looks like the lineup of Kyrie Irving, Marcus Smart, Brown, Jayson Tatum and Al Horford is the leader in the clubhouse. Brad Stevens has about a dozen games left to figure it out and build confidence with whichever group he chooses. After watching LeVert's nasty injury in November, most assumed the Nets' playoff run would be stopped in its tracks. Instead they got themselves right back in the thick of the race and, almost miraculously, LeVert returned to the lineup at the beginning of February. Before his injury, LeVert was the Nets' best player -- a torch quickly grabbed by D'Angelo Russell -- but if LeVert can get himself close to his old form in the last month of the regular season, it would add a devastating weapon to a Nets team none of the East's top contenders want to face in the first round of the playoffs. For the last two seasons, the Hornets have been caught in the dreaded NBA purgatory of being too good to tank and not good enough to make the playoffs. They once again find themselves on the outside looking in, but within striking distance of the eighth seed as the regular season winds to a close. Making the postseason for the first time since 2016 is priority No. 1 for Michael Jordan's squad, as another missed postseason could make Kemba Walker think twice about re-upping with Charlotte this summer, potentially leaving the franchise in ruin if he bolts. With some high-scoring outbursts and clutch performances, Zach LaVine is proving that he might be more than just a bucket-getter for the Bulls. Unfortunately his hot streak has coincided with a subpar month of March for the Bulls' other cornerstone, Lauri Markkanen. It could just be a slump for Markkanen (shooting less than 40 percent from the field and less than 30 from 3-point range this month), but they need to make sure that LaVine's ascent doesn't come at Markkanen's expense. If the Bulls can get both of them playing well at the same time, it would breed confidence for next season, with another lottery pick and the return of a healthy Wendell Carter Jr. on the way. Collin Sexton was handed the reins to a really bad team early in his career, and the progress has been slow. He's shot better than expected from the 3-point line (nearly 40 percent), but that's just a hair under his overall field goal percentage -- not good. More troubling, perhaps, is his low assist total. It's almost unheard of for a point guard to play over 30 minutes per game and average fewer than three assists, but Sexton has managed to pull it off. Some of that is due to the lack of talent around him, but in the last month of the regular season it would be great to see him rack up some eight-to-10-assist games in addition to the occasional scoring outbursts. We covered this in the Hawks' blurb, but Dallas owes Atlanta its first-round pick this June unless it falls in the top five. That means you're probably going to see a lot of losing from the Mavs for the last month of the regular season in hopes that they can keep their No. 1 pick, since they definitely won't keep it next year (same protections) if they have the type of season they expect. Luka Doncic has already proven himself to be a franchise player, so it's time to sit back and let the L's roll in, then hope that the ping pong balls fall their way. Will Gary Harris return to form? Last season Harris looked like a potential future All-Star, averaging 17.5 points on nearly 40 percent 3-point shooting while playing elite wing defense. Due to a rash of injuries he's been unable to get his footing this season, and hasn't played more than 30 minutes in a game since the end of January. Harris will be essential to the Nuggets' impending postseason run, so it's important that he start to show signs of the player he was last season (like he did in a big win at Boston on Monday) if Denver expects to make some postseason noise in a tough Western Conference. The Nikola Jokic-Gary Harris two-man game is one of the most devastating weapons in the NBA when it's clicking, so they'll want to see that get back to a high level as the regular season winds down. After being hampered by injuries for most of his career, Blake Griffin has been healthy all season, and the Pistons need to keep it that way. They've already decreased his minutes from 36 per game to 31 in March (some blowouts have helped), and with a playoff seed all but locked up, barring catastrophe, you'd have to imagine the big man has some more rest days in his future. The Pistons could win a game or two in the playoffs, or even pull off a first-round upset if they wind up facing the Victor Oladipo-less Pacers, and they'll need Griffin to be in top form in order to do that. Defense wins championships ... so where is it? To the surprise of no one, the Warriors have the top offense in the NBA this season. Their defense, however, has been in the middle of the pack -- by far the worst in their recent history. Steve Kerr has said for weeks that his team needs to pick up the defensive intensity before the playoffs start, and while they've shown flashes (big wins at Houston and OKC), they've failed to do it consistently all season long. The team was able to "flip the switch" defensively against an offensively impotent Spurs team without Kawhi Leonard in the first round of last year's playoffs, but they'll have no such reprieve this time around, whether it's the Clippers, Jazz or those very same Spurs. Plus the Warriors have the added hurdle of figuring out how to handle teams consistently attacking DeMarcus Cousins, once he returns to the lineup. For Golden State's sake, it'd be best to try to figure those things out in the last month of the season by consistently putting forth playoff-level effort on the defensive end. Jame Harden's tremendous offensive season has been well documented, but he's averaged over 37 minutes per game, up from 35 last season, in order to do it. There's been plenty of talk about Harden possibly running out of gas in Houston's deep runs over the past few postseasons, and now he's averaging his most minutes since the 2015-16 season. It would be wise to get Harden some rest, or at least tone back the minutes, but there's also incentive to play hard for the No. 3 seed, as that would allow the Rockets to potentially avoid facing Golden State until the Western Conference finals. But if Houston has proven one thing in recent years, it's that they're not afraid of the Warriors -- so don't be surprised if Harden and Chris Paul get a fair share of days off as the playoffs near. Can they get the No. 3 seed? For the Pacers, the difference between earning the East's No. 4/5 seed and the No. 3 seed means a matchup with the Detroit Pistons or Brooklyn Nets versus a matchup with the Boston Celtics -- in other words, there's a huge difference. It won't be easy, as Indiana has one of the most difficult remaining schedules in the league according to Tankathon.com, but they'll have every incentive to play hard every game to earn that No. 3 seed. Some thought the Clippers would drop out of the playoff race after dealing their best player -- Tobias Harris -- at the trade deadline. Instead they've gone 11-5 since then, and could climb as high as the No. 4 or No. 5 seed depending on how things shake out in the final month. While Los Angeles will be a tough out for any opponent in the first round, their playoff ceiling is likely limited due to a lack of star power. With that in mind, their most interesting storyline for the rest of the season is the development of Gilgeous-Alexander, who has been playing the best basketball of his young career of late (he recorded his first 10-assist game in Sunday's win over the Nets). If he can continue to play well over the final few games and have a strong showing in the playoffs, it would do wonders for his confidence as a centerpiece of a team that's looking to make a big splash in free agency this summer. To be honest, there's not a lot to look forward to in Los Angeles these days: LeBron's minutes are limited. Brandon Ingram and Lonzo Ball are both out for the season. Alex Caruso is getting significant minutes. One young bright spot who's still active is Kyle Kuzma, but he hasn't exactly been lighting things up recently. From the start of the season to January, Kuzma averaged 18.9 points per game. In the month of March, since the Lakers' playoff hopes all but disappeared, he's dropped to 13.7 points on atrocious shooting (40 percent from the field, 15 percent 3-pointers). A strong finish from Kuzma would not only be good for his confidence, but it might also bolster his trade value in preparation for an offseason in which the Lakers need to make significant changes, starting with the pursuit of Anthony Davis. In stretches when LeBron's on the bench or resting, Kuzma needs to assert himself as the dominant scorer he's shown himself to be. Can they get anything from Chandler Parsons? It's time for your daily reminder that Chandler Parsons is set to make $25 million next season. So far it's played out as one of the worst contracts in NBA history due to Parsons' inability to stay healthy, but there's still hope. The Grizzlies are playing for nothing but ping pong balls for the rest of the season, so it would be in their best interest to see what -- if anything -- they can get from Parsons. His 16 points in Saturday's loss to the Wizards were the most he'd scored in a game since November of 2017, so maybe that will get him going a bit in the final month. His contract becomes a bit more tradeable next season since it will be expiring, so a good month might entice someone to take a shot on him and allow the Grizzlies to part with a modicum of a consolation prize. Yes, the Heat are in the playoff race at well below .500, but not even the most staunch Miami fan can believe this team has a shot at a first-round upset. So with that, it's best to just sit back and admire the final month of one of the greatest NBA careers we've ever seen as D-Wade plays out his final days. The postgame jersey swaps will get more emotional and, if they end up dropping out of the playoffs, Wade's final home game on April 9 against the 76ers will become that much more enthralling. How much will they miss Malcolm Brogdon? The Bucks have successfully adopted a selfless, next-man-up attitude this season, with likely MVP Giannis Antetokounmpo their only true star, but the loss of Brogdon to a foot injury hurts in so many ways. Not only was he a 50-40-90 player averaging 15 points per game, but he also provided them size and versatility from the guard position defensively. The Bucks will probably have to play at least their first-round series without him, so it will be interesting to see how they alter their rotations and who steps up in the final games of the regular season. All in all it's been a lost season for the Wolves, and now they have to figure out where to go in a post-Jimmy Butler/Tom Thibodeau world. But for now, let's ignore the future and focus on the present. Towns is quietly putting up another 50-40-83 season while averaging 25 points and 12 rebounds -- simply remarkable. His last 10 games have been off the charts (33 points, 13 rebounds on 57 percent field goals and 48 percent 3-pointers), so it appears he's ready to feast for the rest of the regular season. It's pretty much the only reason to watch the Wolves in the final month, but boy is it a good one. With Jrue Holiday sidelined and Anthony Davis relegated to 20 minutes per game (when he plays, that is), the offense has greatly fallen on the shoulders of Elfrid Payton, who has taken full advantage. He became just the fifth player in NBA history to record five straight triple-doubles, and the other names on the list are pretty jaw-dropping: Russell Westbrook, Michael Jordan, Oscar Robertson and Wilt Chamberlain. Payton missed significant time to start the season, and one can only wonder if his presence would have led to a better Pelicans record -- and perhaps dissuaded Davis from making his trade demand -- but we'll never know. All we can do now is see if Payton can keep putting up the numbers, and maybe earn himself a juicy contract this summer. The Knicks are playing for Zion Williamson, but in the meantime we can take notice of a rather impressive streak. Rookie Mitchell Robinson has blocked at least two shots in 19 consecutive games as of this writing, the longest streak by an active player since Hassan Whiteside did it in 23 straight games in 2015. Robinson's also done it in just 22 minutes per game, making it all the more notable. He's got a long way to go to catch Mark Eaton's 77 straight, but at least Robinson gives you a reason to watch some Knicks games for the rest of the season. Andre Roberson's return ... maybe? It doesn't sound likely, but last month Thunder coach Billy Donovan wouldn't rule out the possibility of defensive stalwart Andre Roberson returning to the Thunder lineup this season. Roberson suffered multiple setbacks after a devastating injury last season, but if he can return he would provide a much-needed wing defender to try to slow down some of the Western Conference's best scorers in the playoffs. Even if it's just for 10 minutes per game, Roberson would be a significant addition and possibly give the Thunder a higher ceiling this postseason. If he can play this season, however, it's important to get a few regular-season games under his belt down the stretch rather than throwing him to the wolves (or the Warriors) in the playoffs. The Magic have a chance to make the playoffs -- something we haven't been able to say for quite some time. The final stretch should be exciting, as they battle the Heat and Hornets for the final spot in the Eastern Conference. Every game should be rife with intensity for the rest of the year as Orlando attempts to make its first postseason appearance since 2012. For most of their careers together, Joel Embiid and Ben Simmons had their minutes staggered, but that changed with the addition of Jimmy Butler and later Tobias Harris. Now Brett Brown is playing the duo mostly together, letting Butler and Harris play with the second unit, but is that the best plan for this Sixers team? They'll need these final games of the season to figure out which combinations they want to ride with in the playoffs, since we know their starting and closing lineup of Simmons, JJ Redick, Butler, Harris and Embiid is one of the best in the NBA. The Suns added Tyler Johnson at the trade deadline, but that hasn't stopped Devin Booker from being the de facto point guard. His dynamic scoring is always on display, but he's also racked up nearly seven assists per game, continuing his evolution as a playmaker. The Suns are really bad, but Booker is a special player, and it's worth watching him go to work on the offensive end for the remainder of the regular season. We might even have another 70-point game on the horizon. After a scary fall, during which Blazers fans saw their entire season flash before their eyes, it turned out that McCollum's knee injury wasn't as bad as initially feared. Portland can breathe a sigh of relief, but we've seen how injuries can linger into the postseason, even when a player is "healthy" on paper. It's important that McCollum get rest, but it would be nice if he could have a few regular season games to get back to his old self before the madness of the playoffs starts. If the first half of the Kings' surprising season was about De'Aaron Fox, the second half has largely been about rookie Marvin Bagley. Sacramento has taken significant grief for passing on Luka Doncic with the No. 2 overall pick, but Bagley has proven himself to be one of the most electric young players in the league. With a couple of injuries behind him and the Kings pretty much out of the playoff hunt, it will be fun to see Bagley turned loose in the final few weeks of the season. After starting LaMarcus Aldridge at center for most of the season, the Spurs have started Jakob Poeltl at center for the last eight games which he's been active -- and guess what? They've won them all. Surely it's not all thanks to Poeltl, but Gregg Popovich may be onto something starting the 7-footer who's averaged 7.5 points, 7.6 rebounds and 2.1 blocks over the stretch. He's not going to play 30-plus minutes come playoff time, but Poeltl seems to be emerging as a valuable part of the Spurs' rotation. The Raptors have notoriously managed Kawhi Leonard's minutes and kept him healthy all season, but the same can't be said for Lowry, who's had a nagging back injury for most of the season and, more recently, ankle issues. Lowry was playing the best basketball of his career to start the season, and the Raptors will need him to be at that level for a stacked Eastern Conference postseason. Whether it's resting him or monitoring his minutes, keeping Lowry at full strength is essential for the Raptors down the stretch, especially now that the No. 1 seed is pretty much out of reach. Can they avoid the No. 8 seed? The Jazz overcame a rough start to the season to get themselves into playoff position, but now they're in a dogfight with the Clippers, Spurs and Thunder for the final spots out West. There's obviously massive incentive to earn anything but the No. 8 seed, as that likely means a first-round date with the Warriors. 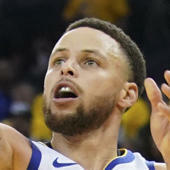 After their playoff success last season, the Jazz have to feel confident against anyone they meet in the opening round, but the Warriors would be a tall mountain to climb. They'll have to do everything they can to stay out of that last spot (unless of course the Warriors end up No. 2, and then tanking to get to No. 8 instead of No. 7 is definitely in play -- we've seen it before). You might not be watching many Wizards games (with good reason), but Bradley Beal has been on an absolute tear. It seems like the guy never misses a shot, and he's averaged 30 points on 50 percent shooting to go along with seven assists per game since the beginning of February. The man is simply unreal offensively, and it's definitely worth checking out as the Wizards play out their final days of a disappointing season.